Martel "Malibu" Taylor is one of the original members of the Crew and has been with us since 1987. 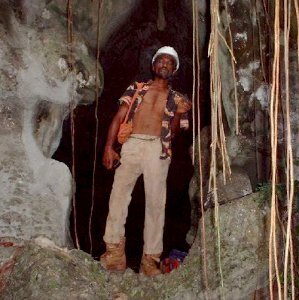 He's been along for most of the caves that we've explored over the years and is one of the main-stays of the Jamaican Caves Organization. His main contributions to the Organization are trail-finding, caving, and his great ability with a machete. As well as being a caver, Malibu often works as a guide for the Troy - Windsor Trail. This historic trail, established by the British Army, centuries ago during the Maroon Wars, crosses the eastern Cockpit Country of Jamaica. With the recent passing of Salla, Martel is now the senior guide for the trail. Malibu is currently caving as an associate researcher, under NEPA permit, assisting in the St James Cave Assesment Project (principal investigator - R. S. Stewart).